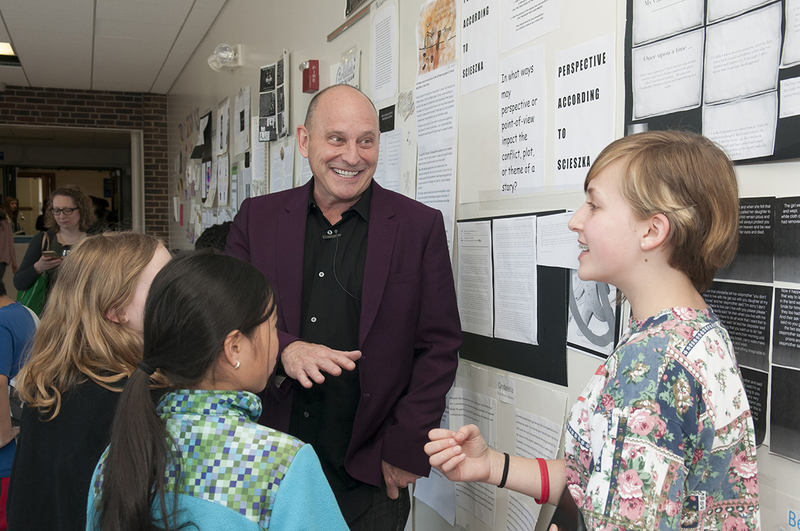 Students got to talk with Jon Scieszka, award-winning author of The Stinky Cheese Man and Other Fairly Stupid Tales. Hundreds of area K–12 students have experienced books in a new way and met award-winning authors through Read & Meet, a program that began in 2015. Students at partner schools Murray Middle School and Hmong College Preparatory Academy in St. Paul have read the books of Jon Scieszka and Thanhhà Lai, respectively—and then hosted the authors. The Read & Meet Initiative was launched with the goal of empowering K–12 students to embrace reading and discuss literature as a way of learning about real-life issues. In the four- to eight-week program, the students create projects based on a specific author’s work. Read & Meet pairs participating faculty and graduate students in the Department of Curriculum and Instruction with teachers at partner schools to design curricular units tailored to the students’ learning needs. It culminates in an in-person meeting with the author. “Watching our learners connect with literacy through this amazing opportunity was beyond compare in my experience as a school administrator,” said Murray Middle School principal Stacy Theien-Collins. The need for students to engage with literature is more urgent than ever, says professor Marek Oziewicz, an internationally recognized scholar of children’s literature who initiated the program. The students at Murray Middle School met Jon Scieszka, award-winning author of The Stinky Cheese Man and Other Fairly Stupid Tales among many books that appeal to children’s silly side. Studying Scieszka’s irreverently humorous work as part of the literacy curriculum helped the students broaden their idea of what is considered literature. And that’s really important. In fact, making literature accessible and personal is the whole point, according to Oziewicz. “The fact that jokes and humor that Scieszka uses in his books are valued as literature produces a level of engagement that would be impossible with traditional, more serious narratives,” Oziewicz explains. As students increasingly are taught prescribed and standardized curricula and teachers are tasked with meeting testing standards, Oziewicz says, student attitudes towards reading are shifting towards books as being “for school” and not “for me.” That has a long-term consequence for students who are reading less and spending more time in front of screens. “Literature can provide a personal, transformative experience for the reader,” says Oziewicz. His current research explores how storytelling and literature can help young people process trauma. He emphasizes that storytelling can be a way to deal with painful events, imagine solutions to complex problems, reflect the human experience, and establish identity. For 80 students in the Hmong College Preparatory Academy in St. Paul, meeting award-winning author Thanhhà Lai in 2017 upended their conceptions of what an author looks like and who has the power to tell stories. Lai’s work focuses on the immigrant experience, including the struggles of acclimating to a new culture and the bicultural experience. The author of Newbery-winning book Inside Out & Back Again and Listen, Slowly came to Minnesota as the featured guest for U of M Book Week. 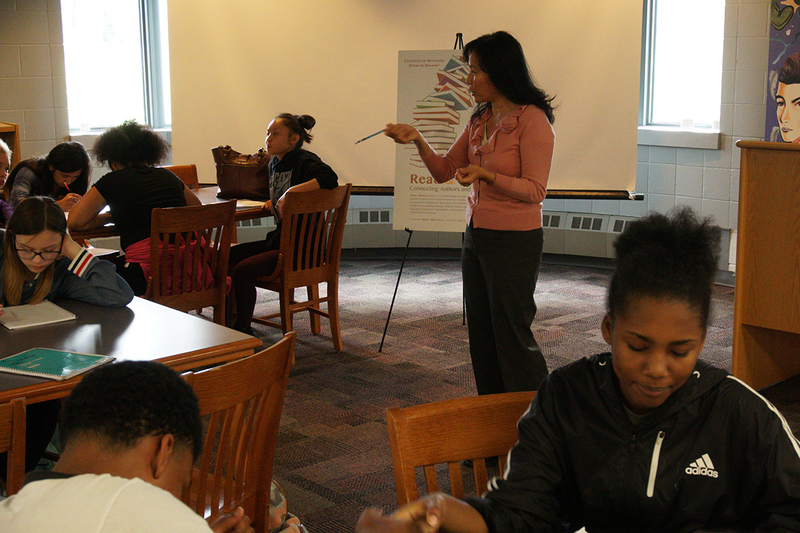 Students in Erica Boulay Ali’s 8th grade class were especially affected by reading a novel by an Asian American author depicting Asian American characters. Many identified with the bicultural protagonist and her story. They began to see literature as something that could reflect and validate their cultural experience. Author Thanhhà Lai works with a student during Read & Meet. Meeting an author can help students form personal connections to literature, says Oziewicz. That level of connection casts reading in a new light and can be the spark that ignites a passion for literature. “This is one of the best experiences I will keep,” declared a student who participated in the 2017 Read & Meet. Read & Meet leverages the opportunity of authors already scheduled to visit Minnesota, and it’s offered to the partner schools at no cost. The 2018 Read & Meet partnership will be based on the work of Nnedi Okorafor, the guest for U of M Book Week on October 25. Learn more about the Department of Curriculum and Instruction.